Production of U.S. Breweries 1863-1994. 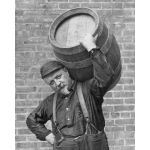 Beginning in September of 1862, the U.S. Government imposed the first federal tax on beer. Thus, relatively accurate computations of total annual beer production are available from 1863 to the present. *Note: The figures for 1920-1932 represent the production of cereal beverages -- aka "near beer" -- containing less than one-half of one percent of alcohol by volume, the legal limit during National Prohibition. Figures are for the fiscal year ending June 30 of the year shown. One barrel equals 31 gallons.